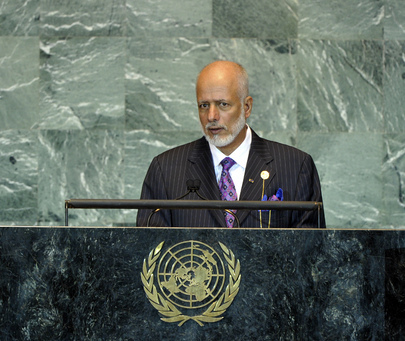 YOUSEF BIN ALAWI BIN ABDULLAH, Minister Responsible for Foreign Affairs of Oman, stressed that, with negotiations between the Palestinian Authority and the Government of Israel at a standstill, the world, and the United Nations in particular, must act to find a just and comprehensive solution. His delegation believed that the establishment of a Palestinian State on the 4 June 1967 border, as well as its recognition as a M ember State of the United Nations, would lead to serious negotiations that would reach just such a solution. Turning to Somalia, where weak political leadership had failed to end the hateful war and to save the Somali people from poverty, ignorance and famine, he said it was time for the United Nations to intensify its cooperation with regional organizations to create a peace plan. Humanitarian aid should also be increased to the millions of refugees and displaced persons among the Somali people. Oman hoped that the 2012 Conference of Middle East States called for at the Review Conference on the Treaty on the Non-Proliferation of Nuclear Weapons (NPT) would declare the Middle East a region free of nuclear weapons and weapons of mass destruction. That conference should also take into consideration the legitimate right of States to use nuclear technology for peaceful purposes in accordance with the NPT and under the auspices of the International Atomic Energy Agency (IAEA). Oman called on Israel to respond to international demands to ratify the NPT and to allow the IAEA to inspect its nuclear facilities. He also urged all parties to continue negotiations and dialogue on the Iranian nuclear file. Highlighting the world’s profound demographic changes, he said the international community should recognize that youth constituted the majority of the global population, in particular as it developed future economic, education and development plans. Specifically, young people should be empowered to use their energies to benefit from technologies and to achieve societies marked by prosperity and sustainable growth. Further, with the world just around the corner from a wide food crisis, efforts must be made on the international level to expand production areas through wider cultivation and the use of technology to increase production and to combat desertification. To reduce the impact of the global financial crisis on countries and societies, particularly developing ones, new principles for investment and international trade must also be considered. All countries, especially powerful industrialized ones, should unite to reduce pollution and greenhouse gas emissions, including through modern technologies. Saying Oman condemned all forms of terrorism committed against the objectives of the United Nations Charter, he reaffirmed the country’s support for international efforts to combat and eliminate that phenomenon. Oman had acceded to most of the relevant conventions and, following the issuance of a royal decree to ratify the Omani law to fight terrorism, a national committee was established for follow-up on that matter. He went on to say that the Security Council’s membership should be expanded to keep pace with the increase in the meetings of the United Nations, to achieve the principle of equality for regional groups, and to end the double standards. He stressed that Oman had come a long way in protecting human rights at all levels. It had submitted its periodic report to the Human Rights Council in January. It was also working to ensure employment and to increase wages. A symposium dedicated to understanding women’s needs and developing their capabilities and its outcomes was being considered as a plan of action to ensure women had the same rights and duties as men. Decisions relating to granting more legislative and oversight privileges to the Council of Oman had also been adopted. He further noted that several health advances had resulted in a higher average life expectancy in Oman.